It’s all going vertical these days. Vertical gardens, vertical farming vertical landscape designs, it seems that more and more people understand that an exposed wall or one square meter of green house, will do much better growing plants upward. The yield is bigger, the water consumption is much lower and building or homes that have green walls have actually a protective shell that can be not only functional, but environmentally positive. The City of Barcelona for example, has elevated growing plants in unlikely places to an art form. Transforming newly exposed party walls into lush vertical gardens, turning urban blight to urban beauty and at the same time supporting and encouraging biodiversity. In 1986, the Barcelona City Council launched The Party Wall Recovery Program, and has over the past 27 years transformed 700 of the city’s party walls left exposed after the demolition of adjacent buildings. Most of these walls have been beautified with artworks or the addition of windows, but in 2010 the City Council’s Institute of Urban Landscape employed “Vegitecture” to bring one such unsightly wall to life. The city engaged Capella Garcia Arquitectura to design the Jardí Tarradellas (The Tarradellas Garden or the Green Side-Wall), a massive modular vertical garden which transformed a party wall into a living wall, a free-standing green facade covering one side of a residential tower in the city’s Les Corts district, a neighborhood where Roman villas once stood before 20th-century urbanization. But such acts of Vegitecture are not so easy to implement, especially when it comes to combining hi-end esthetics with living walls. Hence comes French designer Benjamin Pawlica who has fused design and horticulture to create a plantable concrete wall tile for interior and exterior green walls. The triangular Deltaflore modular system can be put together in any number of combinations depending on the desired shape and size of your wall. Plants are nurtured by an integrated irrigation system and grow from organic shaped holes in the tiles. If cared for properly, the plants will thrive and flow from Deltaflore’s openings, cultivating interesting plays of light and shadow to provide, in the designer’s words, “a poetic atmosphere.” The unique modular system creates an atmosphere that resembles European houses covered with beautiful ivy. Pawlica’s tiles were designed for LCDA, a company that specializes in contemporary furniture and interior design using composite materials. Made with durable concrete and offered in a variety of different colors, Pawlica’s tiles were designed for LCDA, a company that specializes in contemporary furniture and interior design using composite materials. 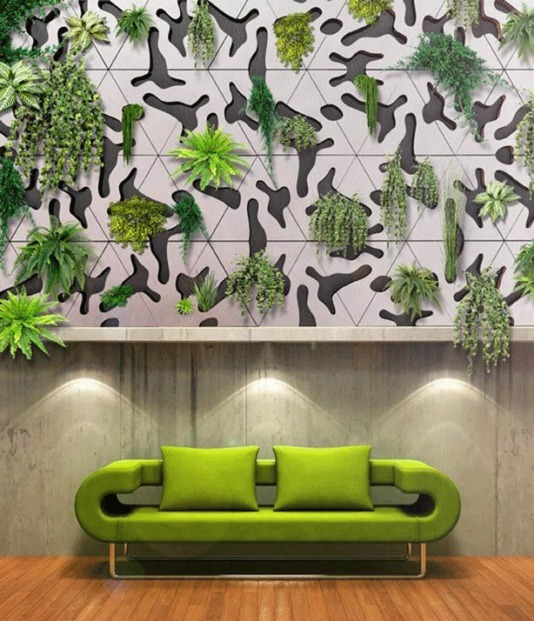 Made with durable concrete and offered in a variety of different colors, the range of possibilities for your very own green wall is limited only by your imagination.